Join us for an inspired afternoon to create your very own flower crown with the best blooms this time of year has to offer. Enjoy our gourmet platter, plus a glass of champagne, in our beautiful boutique store. Our floral stylists will host the workshop, teaching you professional techniques behind the wiring of each bloom and foliage, through to the construction techniques to ensure your flower crown is all loved up. Our 2 hour workshop includes all flowers and materials, a glass of bubbles and a cheese platter. You will take home your floral masterpieces, or if you're feeling inspired wear it out for an afternoon of fun. Pricing is $89.99 pp and our workshops run from 4.30pm to approx 6.30pm. Due to the intimate nature of our open workshop please contact us to make a booking. It's been a wonderful year and we've had some really great groups participate in our Flower Crown Workshops. There are no more scheduled Flower Crown Workshops for 2018. Please check back for 2019 dates. Join us for an inspired evening to create a Christmas wreath with the best foliage the festive season has to offer. Enjoy our gourmet platter, plus a glass of champagne, in our beautiful boutique store. Our floral stylists will host the workshop, teaching you professional techniques behind Christmas wreath making. Our 2.5 hour wreath workshop includes all foliage materials, a glass of bubbles and gourmet cheese platter. Pricing is $109.99 pp and runs from 6.00pm to approx 8.30pm. On the evening of your workshop you will also be able to enjoy an exclusive discount of 20% off store wide. Perhaps you could spoil yourself or finish that last minute Christmas gift shopping. Due to the intimate nature of our open workshop please contact us to make a booking or click the link below. For an activity full of gorgeous blooms, our private flower crown classes are the perfect idea for any birthday, hens, baby or bridal shower. Get your girls together and enjoy an afternoon creating your very own flower crown using the freshest in-season blooms. Enjoy our gourmet platter, plus a glass of champagne, in our beautiful boutique store. 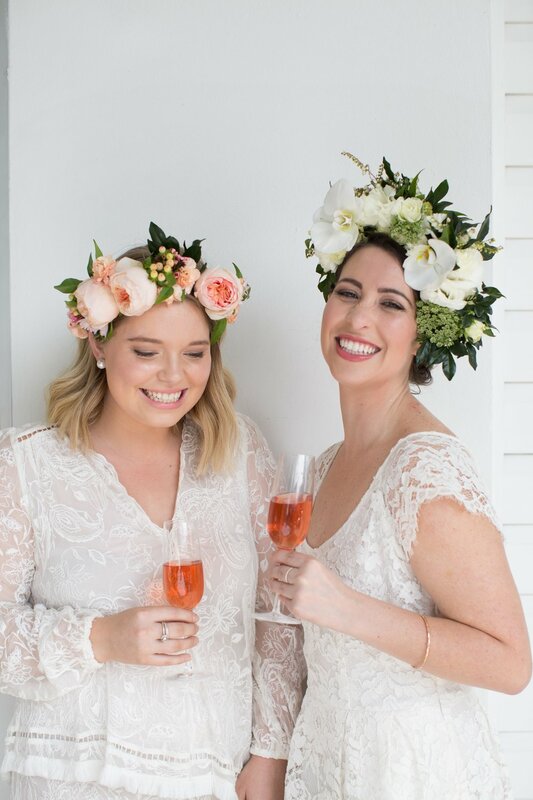 Our floral stylists will host the workshop for wired flower crowns, teaching you professional techniques behind the wiring of each bloom and foliage, through to the construction techniques to ensure your flower crown is all loved up. Our 2 hour workshop includes all flowers and materials, a glass of bubbles and a cheese platter. All you need is extra bubbles and friends to make your next event a White Bungalow one. You will take home your floral masterpieces, or if you're feeling brave continue on the celebrations with it on. Pricing is TBA pp inc gst. With a minimum number of 8 required, please contact us for further details and to check our date availability.